A belated Happy New Year to you! 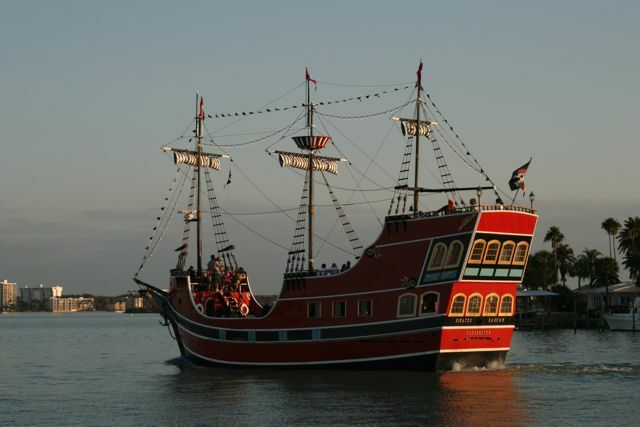 We're glad to have your company on this SlowBoatCruise. 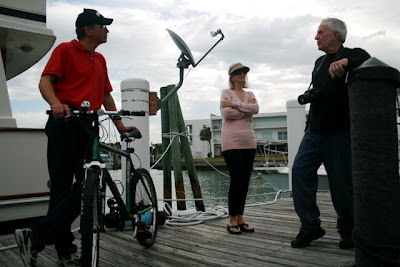 Speaking of company, we were excited to have boat visitors Sunday--Kathy and David Reddy, parents of the crew's WPSU colleague, Emily Reddy, who live in the Tampa/St. Petersburg area. We enjoyed a picture postcard sunset from Dragonfly's stern deck followed by fresh steamed shrimp at the Reddy's favorite little fish shack. 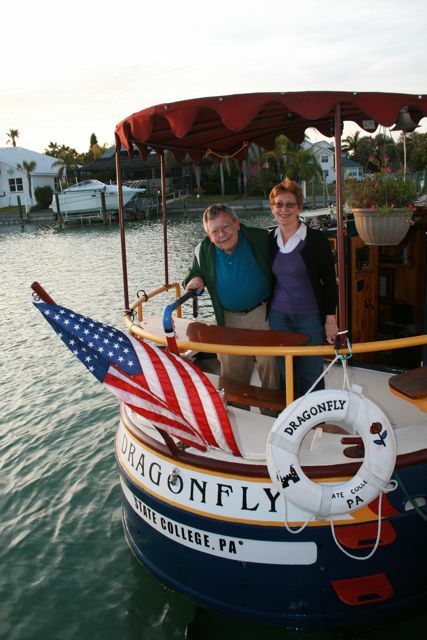 If YOU'd like to be the next guests to visit Dragonfly, here are some places we'll be in the next few weeks: Sarasota, Venice, Sanibel and Captiva, and continuing south on the west coast, Fort Myers. We spent New Year's Eve in Clearwater, Florida, where the streets were thronged with Penn State football fans in their blue-and-white regalia who'd flown in to see their team play in the Outback Bowl. Cap'n wears a Penn State ball cap at all times, so we fit right in. actually this is a family-friendly tourist attraction. On Saturday we had sunny skies but stiff winds as we headed south on the Intracoastal. Our destination: Tierra Verde Resort Marina, a little island south of St. Petersburg. Not that it's a well-known cruising destination; we needed to go there because that's where the Cap'n bicycle was parked. How did the bike travel faster than the boat? you ask. Long story. Back in Apalachicola, Cap unstrapped the bike from its perch on the stern rail, to make room on the deck for a maintenance project. He chained the bike to a bike stand in the parking lot of the hotel attached to the marina where we were staying. Six or eight times, we walked past and said, "We have to make sure to put the bike back on the boat before we leave." Of course we forgot and left without the bike. We didn't even notice it was gone till Andrew and Sally Ann, boaters we'd met waaay back in Canada, caught up with us in Carabelle and said, "Gee, where's your bike?" The "Brotherhood of the Boaters" saved the day again. Cap called Barb and Randy, another pair of Loopers we'd met at an anchorage on the Tenn-Tom and then re-encountered in Apalachicola. He figured, if they were still at the dock, maybe they could bring the bike across. Alas, Barb and Randy were already underway, but they knew ANOTHER Looper, Jim. They gave us his number and Jim (even though he didn't know us from Adam) generously agreed to bring the bike along when he made his Gulf crossing. Jim made it across the Gulf and "crossed his wake" (boater-speak for "completed his Great Loop journey") when he returned to his home port at Tierra Verde--where we stayed last night and retrieved the bike. It was a relief to catch up with the bike, and a relief to tie up, after a day traveling head-on into intense winds. At one point, the Crew was piloting the boat--and feeling pretty self satisfied, thinking to herself, "The wind is blowing a stiff 15 knots, the channel is narrow, with shoals on either side, powerboats are passing us right and left and throwing up HUGE wakes, there's a current running that tends to drag the bow around, and . . . Hey! I'm doing pretty good here, driving the boat!" Just then, Cap came on deck, and pointed to the boat coming up behind us. Crew glanced over her shoulder and saw a big, powerful cruiser, nearly as long as Dragonfly, you know the kind. . . little cockpit-like depression up on the bow with upholstered seating, where two thirty-somethings in windbreakers and ball caps were lounging, enjoying the ride, eyes forward. Behind them, perched on the captain's chair, their pilot, holding the wheel with easy nonchalance, putting down a razor-straight wake . . . a skinny little six-year-old girl, in a pink sweatshirt and matching Keds, long brown hair pulled back in a ponytail. So easy, so very easy, that only a child can do it! She didn't even throw us a glance as she passed. Congratulations Jim! And thanks for getting the Dragonfly to stop in Tierra Verde so we could visit Cynthia and Bill.